There are 2 types of proxy, public proxy and private proxy. Public proxy is open to public usage. Private proxy is only open to paid users. There are two types of proxy, public proxy and private proxy. Public proxy is open to public usage. Private proxy is only open to paid users. Public proxy as known as open proxy is open to public usage. Every one can use it. Because of the lack of access control, the public proxy may be used by too many people. It makes the public proxy stop working if the number of users exceeds its capability. If a public proxy can be found easily on the Internet, it will die very fast. However it will work again when less people use it. Thus public proxy is usually unstable. Though public proxy can usually keep working for only several hours, it has its advantages. You can find and use them for free. There are lots of public proxies on the Internet. You can use them to change your IP frequently. If you don’t know how to find them by yourself, you can buy our checked public proxy list. We update our public proxy list every day and check them from time to time. It ensures there are enough working proxies in the list. Private proxy is only open to paid users. You need to pay for the private proxy. It has good uptime. You usually need to input username and passord to use private proxy. The private proxy vendors control how long you can use their private proxy. 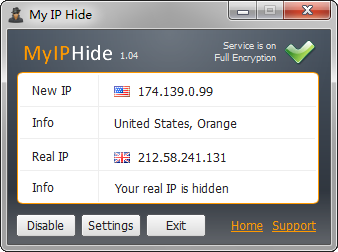 Our private proxy service is My IP Hide. It’s encrypted private proxy service. It can unblock websites (ex. Facebook and Youtube) as well as change your IP. Is Proxy Safe to Use? Next Next post: Is Proxy Safe to Use?